A new Mudlet 3.3.1 is here! This release brings in a whole new editor for Lua code, a completely revamped IRC window, and utf8 in Lua! Remember that you can also install dark themes for Mudlet itself and also make your own! The documentation lists out all of the new available /commands. A lot of IRC functions have been added for scripting as well: getIrcNick(), getIrcServer(), getIrcChannels(), getIrcConnectedHost(), setIrcNick(), setIrcServer(), setIrcChannels(), restartIrc(). We’ve removed the statusbar in the main window now that it has served its purpose! The original idea was to guide people towards opening the Connections dialog – that opens up automatically now, and showing descriptions for the mapper’s right-click menu – tooltips are used for those instead. @Kae and @demonnic got their hands dirty and completely upgraded Mudlets infrastructure: the wiki and forums are the latest version, and HTTPS support (green lock) has been enabled everywhere! Thanks to this, the wiki registration is now openly available and we can spend more time improving Mudlet rather than banning spambots on the forums. 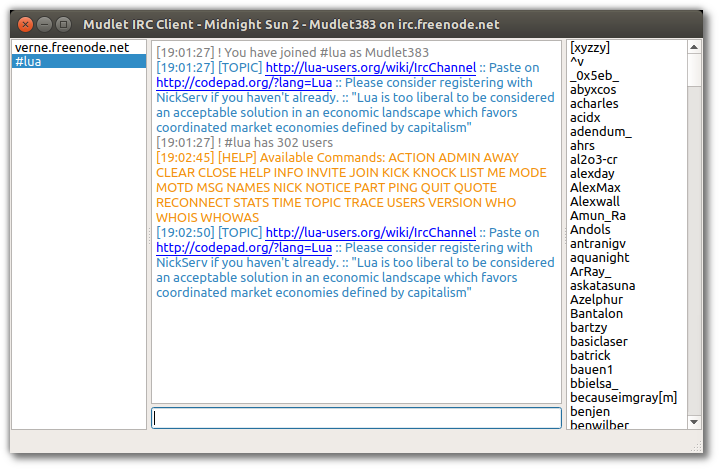 Syntax highlighting on forums and wiki has also been aligned with Mudlets own so it is consistent everywhere. @Kebap has been spending a lot of time improving Mudlets wiki recently, doing everything from formatting to documenting new – and old that we’ve missed – functionality. Appreciate all the help! We’ve continued with the vision of making work with many languages and added a Lua utf8 library in 3.3, which allows you to work with non-English text in Lua: Spanish, Russian, Chinese, and so on. See documentation for more. mudlet.supports.coroutines and the new key-related functions (tempKey, permKey) didn’t work as advertised in the last Windows release – this has been fixed. The so-called MC++ is used in developing Mudlet – if you haven’t checked up on C++ in the last decade, here are some of the highlights of what is now available: auto, lambdas, and more. C++ is the language that powers many game engines (Cryengine, Unreal Engine), browsers (Google Chrome, Firefox), and a lot of other things you’re using. If you’re curious to get started, try your hand with editing Mudlet! The map data is now loaded by default again when the profile is opened, so you don’t have to open the map to get your scripts to work. There’ll also now just be one loading messages should everything go okay. fixed button being left behind when parent toolbar is deleted.